We are keep on porting modules on CS-Cart 4 engine. 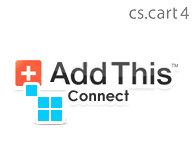 AddThis Integration add-on also became compatible with CS-Cart 4. We constantly keep an eye on the improvements in addthis service. Smart Layers function is now available. According to addthis site “Smart Layers – Make your site smarter. Increase traffic, engagement and revenue by instantly showing the right social tools and content to every visitor. It’s one piece of code, mobile-ready and free!” Let’s look at it in details. Smart Layer function supplies two options- Social Sharing and Follow buttons. It’s a floating panels that have 4 themes to choose from, attractive buttons that can be hidden at any moment if they disturb user’s view. This innovation is definitely a useful function and you should take advantage of this. Try out this new cs-cart addon! It should be noted that if you want to use the Smart Layers option there is no need for you to use separate functions Share and Follow in the module. For AddThis module we’ve already made very useful video tutorials that will show you how the module works, basic setup and ways of using it on your site. Our video tutorials are here to help you get the most out of your AddThis module experience. Below you can find the video list that is also available on the product page. This entry was posted in CS-Cart addons and tagged cs-cart addons, cs-cart addthis, cs-cart social plugins. Bookmark the permalink.